On Winter Solstice Ailia visits her favorite place to ponder: a large cliff overlooking her hometown. On her way home, Eiess and an army of Vikings capture her before attacking the Northlandic Kingdom. After usurping the Northlandic Throne, Eiess immediately suspends the seasons on the darkest and coldest day of the year and begins her preparations for the prophesied battle to end all battles. Princess Lucia, sole heir to the Nothlandic Throne, is taken prisoner by Eiess and is thrown into the castle’s tower. For months, Lucia wastes away, never knowing when this nightmare of beatings, starvation and bitter cold will end. But when she miraculously escapes, she learns that she has a twin sister she must find before Eiess completely destroys the Northlandic Kingdom. Months later, Ailia wakes up in a glacier cave with no memory of how she ended up there. On her way home, a handsome, yet mysterious young man named Soren rescues her from wolves and a dangerous shape-shifter. Ailia is immediately drawn to Soren, thinking she knows him from somewhere, maybe from her dreams of another life? He reveals he is a Sentinor sent by the gods to defeat Eiess and is waiting to be reunited with his soul mate, Lucia, so they together can defeat the Empress. As Eiess continues to amass her forces, Ailia, Lucia and Soren are about to discover that their destinies are intertwined behind a veil of dark secrets and lies. If they are to take back the Northlandic Throne, they must work together and form an alliance. But their mission to overthrow the Empress is stalled when the secrets and lies surface. And when a strong love develops between two, jealousy and duplicity arise between them, causing one of them to betray the others – a betrayal which puts their lives and the lives of humanity in grave danger. 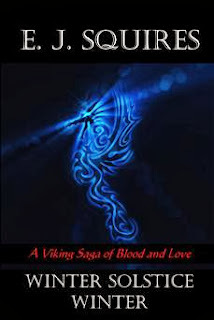 WINTER SOLSTICE WINTER is a Young Adult/New Adult fantasy romance set in the Viking Era. With Suspense, Norse paranormal elements and a breathtaking soul mate love story, it's a great read for those who enjoy a page-turning story. This is the first book in its series. I was intrigued by the thought of a fresh story line involving Norse mythology and vikings. I'm game for reading things I haven't read before if the story line seems interesting. The synopsis I read could not hold a candle to what I actually read. This is one of those books that once you start it you really don't want anything to interrupt it. The author has created a world that you get wrapped up in and don't want to leave. The details she adds, as well as the twists and turns makes this a fast paced read and one you will want to recommend to everyone you know who loves fantasy. We find three lives entwined in an age old tale of good versus evil. But just when you think you know it all, you realize you don't. I look forward to the second book in the series. It is definitely a must read.